Of great concern to us is the breakdown of political discourse by stonewalling and obstructive tactics. We long for in depth respectful conversation about complex issues. While searching for visual archetypal symbols of cooperation, we discovered the handshake, a gesture of reciprocity. We paired our own text with John Bulwer's images from, The Natural Language of the Hand (1644), the first scientific study of hand gestures. We altered an 18th century handwritten contract to signify the social contract between governments and their people. As the contract begins, various shades of gray and black weave through a stable structure with cooperative hand gestures, a demonstration of the balance of expression necessary for a democracy. 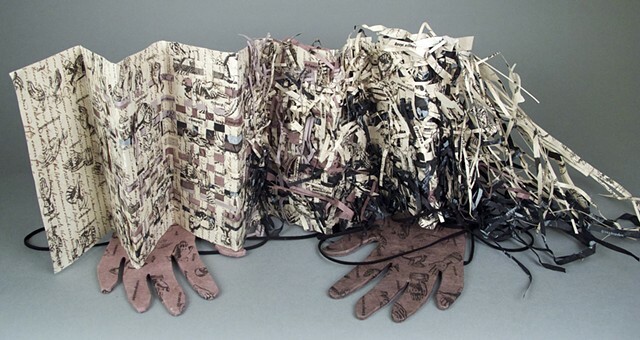 As the book progresses the weaving begins to fall apart, gestures and text become hostile. The contract ends as two opposing opinions dominate. We bound hands as book covers. We untie our hands each time we open the book and examine the issue.